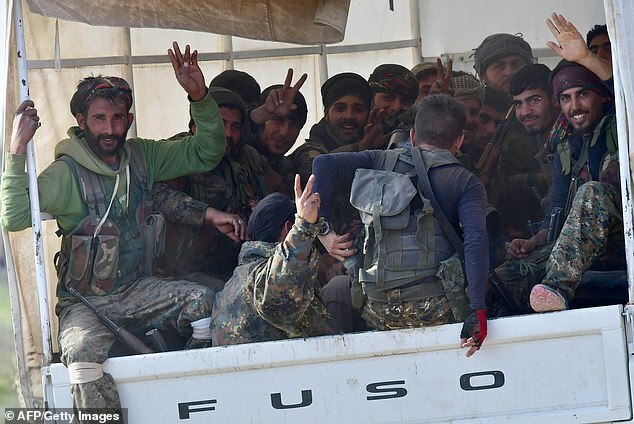 US-backed forces have denied Kurdish media claims that they have captured Islamic State’s final enclave – insisting the operation is still underway. Hawar had earlier said Syrian Democratic Forces (SDF) had ‘liberated all of Baghouz from the Daesh mercenaries’ and that the campaign had ‘ended with the defeat’ of the terror group. 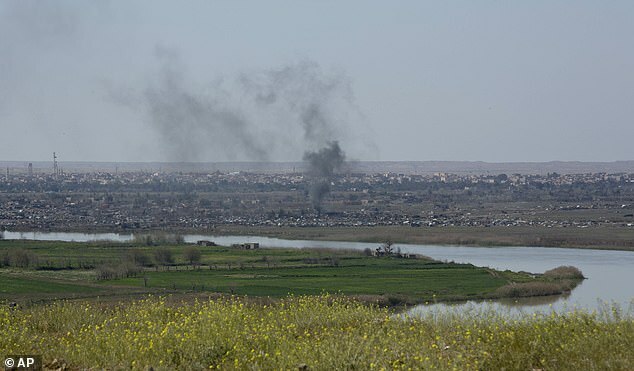 However, SDF officials denied the reports and said combat operations were still underway today. It comes the morning after US President Donald Trump predicted ISIS was on the verge of being wiped off the map, unfurling printouts showing the jihadists’ shrinking presence in Iraq and Syria. 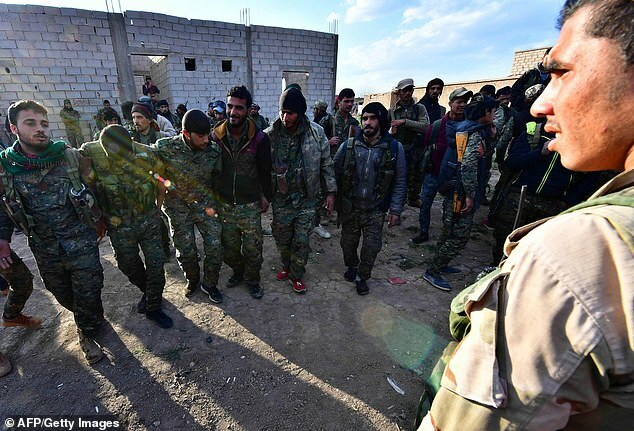 ‘Combing continues in the Baghouz camp and there is no truth (to the report) about the complete liberation of the village,’ an SDF media official said, quoting the commanders of the offensive. Trump yesterday claimed American forces have inflicted significant casualties on the battlefield in the past month. He has signalled the group’s imminent demise on several previous occasions, although ISIS has yet to wave the white flag of surrender. In one map shown by Trump to reporters in Washington and then again at a rally to workers at a military tank factory in Lima, Ohio, ISIS territory marked in red extends over large areas. A second map, he said, shows the extremist organisation about to be wiped out. ‘There is no red. In fact, there’s actually a tiny spot which will be gone by tonight,’ he said at the White House. ‘When I took over it was a mess, they were all over the place, all over Syria and Iraq,’ he said of ISIS, pointing at the red territory. ‘And now you look at it, and there’s no red,’ he crowed as workers cheered. After sweeping across swathes of Syria and Iraq in 2014, the ISIS jihadists’ cross-border caliphate was whittled down by multiple offensives to the tiny embattled enclave in Baghouz, Syria. 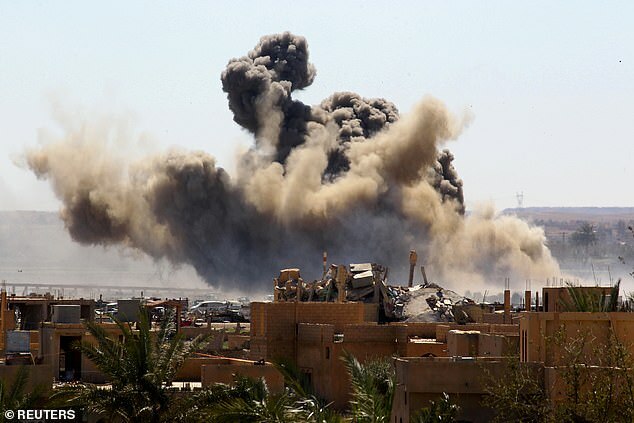 Fighting continued in Baghouz on Wednesday, with the ISIS jihadists surrounded and under heavy fire from a US-led coalition of Kurds, Syrians and others.